EXCLUSIVE! Only Backup Solution Designed Specifically for PGP Whole Disk Encryption -- completely eliminates the unnecessary downtime and security and compliance risks associated with other backup and recovery products. EXCLUSIVE! Safe, Secure, Fully Encrypted Backups and Recovery -- Ensures all of your data remains in its original encrypted state during and after the backup and recovery processes. With Casper Secure, your data is never placed in an exposed or unencrypted state. EXCLUSIVE! Ensures Compliance with Existing Security Directives -- Because all data is backed up in its original encrypted state, there are no new passwords to manage, and more importantly, there are no new security protocols or encryption technologies to vet. With Casper Secure, the backup is guaranteed to be as secure as the original. EXCLUSIVE! Fast Disk Upgrades and Replacements -- quickly clones a single disk or hardware RAID array encrypted with PGP Whole Disk Encryption to another disk or RAID array for increased speed, increased capacity, or to replace a failed disk or array. EXCLUSIVE! Complete System Backup Protection -- creates a complete, fully bootable, backup replacement of a Windows server system disk or hardware RAID array encrypted with PGP Whole Disk Encryption. EXCLUSIVE! Fast, Instantly Bootable Backups -- maintains an instantly bootable backup replacement disk or hardware RAID array for a Windows Server encrypted with PGP Whole Disk Encryption in the same amount of time required by other backup and disk imaging solutions to perform a partial or incremental backup. EXCLUSIVE! Rapid Recovery -- eliminates the arduous data restoration and lengthy re-encryption process required by other disk imaging and backup solutions. 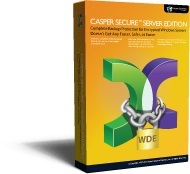 In the event of a hard disk failure, a backup created by Casper Secure Server Edition can be used as an immediate and permanent replacement for the failed disk or hardware RAID array or restored to another disk or array in a single step. With Casper Secure, there is no lengthy downtime and no need to spend time re-encrypting the server. EXCLUSIVE! Unparalleled Safety and Dependability -- brings backup dependability to a new level by automatically verifying the integrity of the backup during the backup process. With exclusive AccuClone™ and Automatic Copy Verification technologies, you can rest easy knowing that your backup is complete and has not been compromised by faulty RAM, a defective cable, failing disk, or bad controller interface. Around the Clock Protection -- enables complete system backups to be performed at any time without leaving Windows, so there is never a need to restart or interrupt the operation of a server to create a backup. In addition, features such as integrated scheduling and SmartAlert technology permit backups to be performed completely unattended in the background for true “set it and forget it” operation.